PDF Converter Professional 6 - ACE Peripherals ::: Completing I.T. This age-old bit of advice is just as important today when working with PDF files. You can view PDF files using a free reader but that's all you can do, it doesn't give you the ability to create or edit PDF files, never mind collaborate on them. Creation-only utilities provide no viewing, editing or security. With complete PDF functionality from PDF Converter Professional 6, you’ll be able to eliminate time-consuming tasks that slow you down and cost you money. Thanks to best in class document conversion you can access valuable information trapped in a digital or scanned document. You can save even more time by converting static PDF forms into fillable PDF forms with FormTyper. You can also make quick edits to your PDF files on the fly without the need for authoring software. Conveniently share your documents by creating 100% industry-standard PDF files from virtually any PC application. And of course, protect your work from unwanted use with 256-bit encryption and password only access. Create 100% industry-standard PDF files, from virtually any PC application, that are fully compliant with other PDF viewers. Toolbar shortcuts for Microsoft Office allow you to make a PDF copy of your documents with a single click. Instantly and accurately convert PDF files into fully-formatted Microsoft Word, Excel, PowerPoint, XPS, and Corel WordPerfect documents — complete with text, columns, tables and graphics. Easily edit directly within PDF files. Correct typos, edit and annotate both text and graphics directly within PDF files. Fill and save PDF forms with FormTyper. Convert static PDF forms into fillable PDF forms that you can complete, save, and email. With one click, FormTyper locates the fields on your form – even on scanned forms – and adds fillable fields without changing the original! 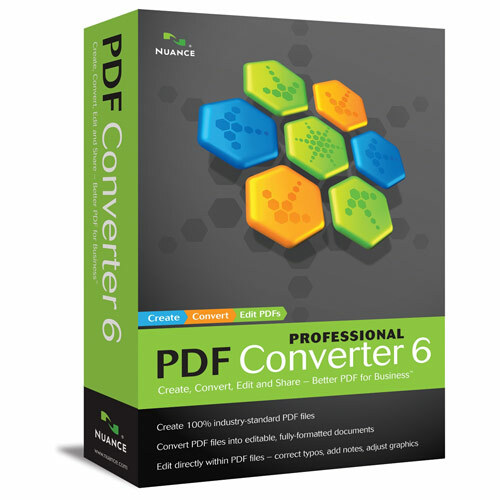 Check out the feature comparison between PDF Converter Professional 6 and PDF Converter Professional 5. Actual conversion results can vary depending on document, spreadsheet and presentation attributes. Web access needed for product registration, activation, and obtaining live updates for the program. To save DOCX, XLSX and PPTX files (for Microsoft Office 2007 Word, Excel and PowerPoint) you should have or install Microsoft .NET Framework 3.0. The Microsoft .NET Framework 3.0 is part of the Windows Vista operating system and does not need to be installed there. The Microsoft .NET Framework 3.0 can be installed on Windows XP.